– Hey! You don’t get to draw! I obviously sacked my token! Would be silly not to! – You didn’t say anything! I get to draw!! Considering this infraction a Player Communication Violation (PCV) in this situation would solve the problem of the extra card in Nicole’s hand without giving her a Game Loss (for drawing extra cards) and seems like a pretty easy solution… Maybe a little too easy? The name “Player Communication Violation” may be a little confusing at times and it could be assumed that the name suggests something to do with problems due to the communication between players. However, the definition of a Player Communication Violation in the Magic Infraction Procedure Guide states very clearly that “A player unintentionally violates the Player Communication policy (MTR 4.1).” and has actually nothing to do with miscommunication between players or with the official shortcuts (MTR 4.2). Alan casts the last card in his hand, Balance of Power (“If target opponent has more cards in hand than you, draw cards equal to the difference”) and asks Naomi how many cards she has. She says “seven” and Alan therefore draws seven cards. After a little while, Naomi notices that she only had six cards and they call a judge. This is not Drawing Extra Cards as the drawing of too many cards was preceded directly by a Player Communication Violation (Naomi represented derived information incorrectly). 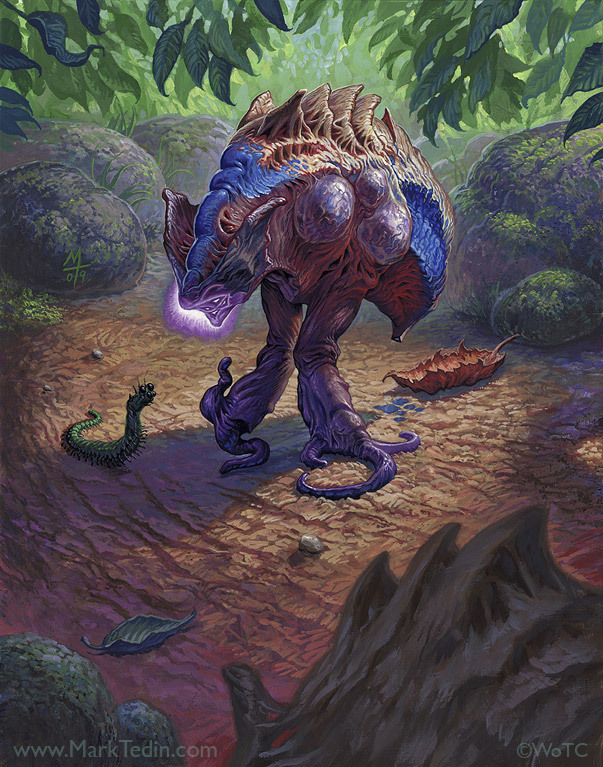 Antony attacks with his Tarmogoyf. His opponent had just removed his graveyard from the game and asks Neal how big it is. Antony answers with “it’s a 2/3” and Neal blocks with his 3/3 creature. After damage is dealt and as Antony is putting his poor Lhurgoyf into his graveyard, he notices that he actually had three different card types in his graveyard and Tarmogoyf would have survived (being 3/4). The current power and toughness of a creature is derived information and Antony was not obligated to answer his opponent’s question (until it deals its damage, that is). If, however, Antony decides to answer, he has to do it correctly… and he didn’t. In those cases, it is best to call a judge and let him figure out if and how to back up the game. There is actually a multitude of different scenarios but most of the problems can be grouped in two different cases. It is always assumed that both players are acting in good faith and were not trying to play any mind tricks on his or her opponent. Problems related to mind tricks (e.g. a player tries to force a suboptimal play by his opponent) are a completely different kind of issue. The Cryptic Command situation we encountered at the beginning of the article falls into this category. It is not Player Communication Violation because Nicole and Alice didn’t communicate about what was happening! In this kind of situation, it is actually normal for both players to interpret the action in the best possible light for him- or herself. Alice will have sacrificed her token while Nicole will have her spell resolve. A judge hearing the play independently will get two different stories. So how do we correct such a situation? Alice played sloppily by not announcing the use of the token’s ability, something the rules are very clear about, and most of the time the judge will rule in Nicole’s favor. The token was bounced and Cryptic Command resolved. In most cases, if a player does not communicate his intention and it is misinterpreted by his opponent, the “default” action will be used. This is similar to a trigger with a “may” ability implicitly resolved by a player without any mention to his opponent. In this case, the trigger resolved without doing its effect as well. Arnaud uses the [-1] ability of Jace Beleren after casting it, saying “I draw a card.” Neveal heard “Draw a card” seeing Arnaud working on his die. After drawing a card, Neveal asks: “Shouldn’t it have five counters on it?” Both players notice that something is wrong and call a judge. At first, this could be seen as Drawing Extra Card(s). A player draws a card when he shouldn’t without a Game Rule Violation or Player Communication Violation infraction directly preceding it. However, this situation can not only be abused by Neveal but by Arnaud as well. If we believe the explanations of the players are benign, we should rule this situation as a misunderstanding between both players. We back up by putting a random card on top of Neveal’s library and caution both players to be more careful and communicate more clearly next time. The whole problem of miscommunication is exponentially greater if both players are speaking different languages, resorting to signs and/or English to communicate, a language they may not be used to. In this scenario, both players hear the same word but interpret it differently. There are actually countless different possibilities and problems that can go wrong when players communicate with each other. As soon as we know the error was genuine, we have to handle each situation on a case-by-case basis. As a general rule of thumb, we go back to the point where the communication occurred (if caught in a very short timeframe) and let the player continue to play cautioning them to play more clearly from now on. There is currently no infraction for miscommunication so we don’t give them a penalty and we should not try to make this problem fit into another infraction just because we want to give them a Warning. Miscommunication between players can create complex situations, sometimes with the disclosure of hidden information (drawing a card, for example). We do not have an infraction for such behaviour and this raises the question: Do we need a new infraction to handle all types of miscommunication? If we look at all the situations above it becomes apparent very soon that having a Tournament Error (which means that you only get one warning before it is upgraded to a Game Loss) or even a Game Play Error (you get two warnings before it is upgrade to a Game Loss) for something that can happen all too easily is not in the best interest of the tournament as a whole. Most of the time, those infractions would fester resentment towards the opponent because he played sloppily and “won” the argument or because he was perceived as a rules lawyer and got away with it. We don’t want players to be angry at each others when we resolve a misunderstanding. Another issue is: Who do you want to give the infraction to? Do we give it to the one who did something or to the one who interpreted something completely different from the action? Remember, it’s completely normal to interpret an action in the best way possible! If we give it to the one performing the action, we would have players shying away from using shortcuts and announcing every step of everything. We would not be able to finish a game – much less a match – in any respectable amount of time! Do you know how long it takes to cast a spell if you announce every step explicitly? Try it! If we give it to both of them (let’s be fair here! ), we run into the problem of having players resolving complex situations by themselves, not because they want to but because they are afraid to call a judge and get penalized! This goes against everything we stand for as we are there to help the players within the constraints of tournament fairness. The Player Communication Violation infraction is used when a problem occurred with public, derived, and/or private information at the core of the problem. Misunderstanding an opponent, be it with implicit (a gesture to say “your turn”) or explicit (a grunt to say “your turn”) communication does not fall into this category. There is no way to completely remove miscommunication from the game. Even not communicating is a problem and may not help (on the contrary). We as judges should do our utmost to smooth those kinks over as best we can when the situation comes along. It may come to an “I say – he says” situation where we will be asked to use our judgement and our feel for the situation to rule. Being impartial and trying for the best and most consistent resolution of the problem independent of the game state is a service we are offering as part of the smooth running of tournaments. It is something players should feel comfortable asking for without the fear of being punished.